Although we are still facing the woes of an unusually cold winter, February is here and it’s time to turn our thoughts to lawn maintenance. The old timers say “an ounce of prevention is worth a pound of cure” and the proverb rings true when controlling crabgrass in your lawn. A pre-emergence herbicide application can save you time, money, and effort by killing the weed shortly after the seeds germinate. 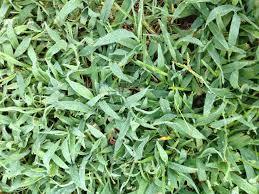 Crabgrass is a summer annual and is one of the most common weed problems infesting Louisiana lawns. The seeds need temperatures of 55-60° F to begin germination. Temperatures in south Louisiana begin to reach these heights around mid-February. Applying a pre-emergence herbicide to your lawn around Valentine’s Day will prevent these weeds from taking off. Pre-emergence herbicides kill weeds as they germinate and before they emerge from the ground. When applied as directed, pre-emergence herbicides will not injure established lawns. Products containing dithiopyr or pendimethalin are excellent for controlling crabgrass in February. Look for products such as Sta-Green Crab-Ex, Hi Yield Dimension, Greenlight Crabgrass Preventer 2, and Scotts Halts at your local garden store or co-op. Always follow the label directions when applying herbicides. Another common weed that can be managed in February is Burrweed. As kids we called this weed “stickers.” Burweed is a cool season weed that germinates in the early fall. In the spring it flowers and produces spiny seed pods. These spiny seed pods are what give your bare feet heck in the summer. Try and catch Burrweed soon because after the seed pods have formed you will be out of luck. Look for a herbicide containing atrazine, 2, 4-D, or dicamba such as Weed B Gon, Weed Free Zone, or Atrazine. February is also the perfect time to re-evaluate your lawn and garden goals and prepare for the upcoming year. Whether your goal is to maintain a perfect lawn, cultivate flower gardens that rival Versailles, or feed your family from your vegetable garden, everyone must start in the same place: a soil test. Soil is the foundation of your lawn and gardens and must not be forgotten. As plants grow they use nutrients from the soil. After a while your soil may need some of these nutrients replenished with fertilizer. The LSU AgCenter has a soil testing lab and can analyze your soil for nutrient deficiencies. For the most accurate information you will need to take soil from multiple spots in your lawn or garden and mix them together. Use a shovel or a soil probe to dig down about two inches into the ground and collect the soil. You can collect soil from 15-20 spots. Once the soil is mixed, take a one quart bag full of the soil mixture to your local Extension office, along with $10 cash, check, or money order. The staff at the office can take care of your soil sample. You should receive results within two weeks and your local Extension agent can help you interpret them. Jessie Hoover is a County Agent with the LSU AgCenter covering horticulture in East Feliciana, West Feliciana, St. Helena, and Tangipahoa parishes. For more information on these or related topics contact Jessie at 225-683-3101 or visit www.lsuagcenter.com.